Imagine the fever dream scenario where a misguided software consultant creates a Capability Maturity Model (CMM)for people and their kitchen knives. On the left side of the ascending scale one is thoughtlessly putting knives in dishwashers, then moves up to using a sharpening steel and renouncing glass cutting boards forever. At the far right of that scale comes measured, controlled, then optimized processes. If not wiped clean after use and kept dry this knife will rust. A carbon steel knife should not be your first “good knife”. That’s right no chromium or “I’ll clean up later” for this steel. Stainless forgives and the brotherhood(carbon) doesn’t. When handled correctly it will develop a patina, cut like nothing else and last generations. If you have never used one or the thought of buying someone else’s old knives leaves you flat these are a good start. 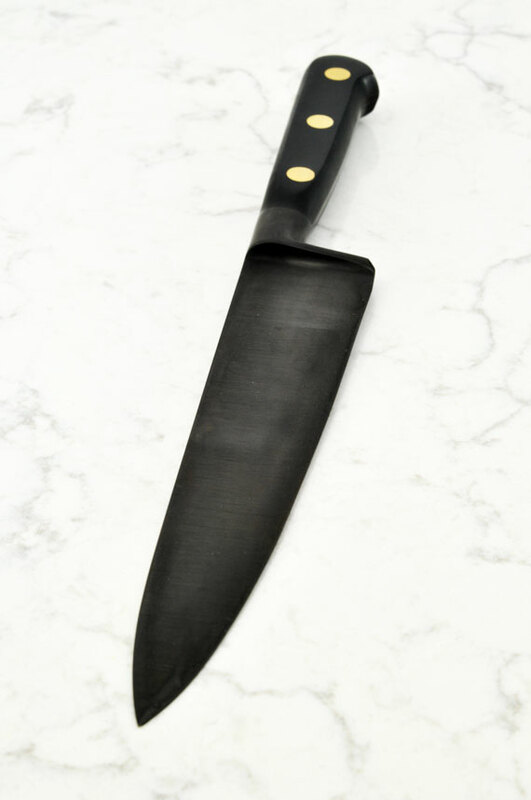 Sabatier is the name of a style/type of knife made in France. Not all Sabatiers are equal and not all are carbon steel. We start with a high quality factory imported French knife then apply a “Force Patina” and sharpened on a wet-stone. The force patina is a uniform application of natural acids to protect the knife and help you get started. Over time and use the finish will evolve and develop it’s own unique character as a testament to your capability and maturity.